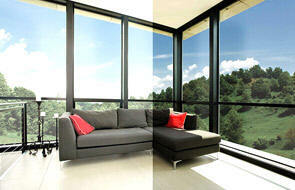 JT Window Tinting offers tinting for residential windows across Southern California. One of the primary reasons for tinting your residential windows in Los Angeles, CA is that it lowers your energy bills. The window tint film minimizes heat loss in the winter and decreases air conditioning costs in the summer, which saves you money on energy costs. This makes your windows more energy efficient and your rooms more comfortable to be in without replacing your windows. Residential window film can substantially reduce the fading caused by the sun on your chair fabrics, carpets, artwork, curtains and even wood. You can enjoy the sunlight without the fear of furniture damage. Adding window tinting for your home adds security and safety. When a window that does not have a protective film is broken, glass fragments are scattered throughout the room with great risk of injury to your family. The broken window will also allow rain to enter the room creating potential water damage. Windows with a security film stay attached to the film even when it is broken, thus protecting the occupants. Security window film offers greater protection to your home against storms and vandalism. Privacy window film can be added to windows to make areas private without sacrificing light. This tint can be used in bathrooms and glass doors, or windows that face the street. Tinting gives you a clear view of outside, but prevents people from being able to see inside your home. Window tinting adds a decorative element to your house. The tinting imitates the look of expensive windows, but at a much lower cost. It can also easily be removed if you move or would like to change the look of the windows. Get in touch with the window tinting experts at JT Window Tinting for a free estimate or for more information on the residential window tinting services we offer across Southern California.